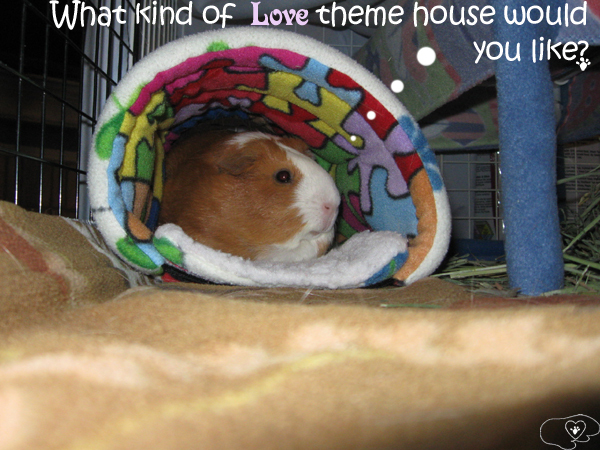 GL Medical & Care Guide Forum Home SALES Fun for Guinea Pigs! Some more fun for Cyber Monday, and Tuesday. Free pad with each house and lounger bed purchase! November 27th & 28th only. Purchase any house and/or loungers as usual and I'll automatically make a pad for each one. No codes or adding to cart needed. Yay for Cyber Monday AND Tuesday! Isn't this where we usually ask for proof, Lynx? *grins* Hope her molting this year is much easier too. She quit laying eggs earlier this year and I think that has slowed down her molt. She lost a few sets of feathers (like her tail feathers and another area) but has not had a drastic molt so far. But she is slowing down eating and very slowly losing weight (it does fluctuate). I hope she does not have a hard molt this year too! It's been a few months and I hope everyone had a wonderful Holiday Season! Our holidays were quiet and the girls got to flirt with a couple vacationers across the way, but the new year soon took a turn a week in. Sadly, though not unexpected, Ellie was helped over last Monday to reunite at the Bridge with her sister. Luna, I'm sure, has been tolerant of me this week, though soaking up the extra snuggle time. Today, we're moving things around a bit for a change of pace and trying to decide what new house she would like and thought we'd ask all of you! I haven't decided if I'll make only one kind, two, or more. I guess that depends on your answers and what kind of time I have, but I will surely say and show what gets made. Can't wait to hear your ideas! I am sorry to hear about Ellie. I know you will miss her. Are there any nice heart shaped vegetable prints that might work? I'm sorry you lost Ellie. Thank you bpatters and Lynx. Yes, Ellie will be greatly missed. Perhaps Lynx, but the designs never come without some sort of inspiration, something that seemed to start drying up into far between spurts after Jr died. I've been struggling since, I loath to admit. Would an easily detachable heart-pad as a "front door" entry pad work? Hearts seem to be a natural but due to their shape, maybe difficult to come up with an actual hidey that has enough body to hold itself up in the correct form. I already have a couple versions of the designer heart pads. I was considering offering the shell hearts (like the sea shell), again this year. They went over decently when first designed but I was hoping for something new .... for Luna of course! I was fooling around at lunch with a rose bed design and music heart notes, although the later seems like it would be a bit to pricey to make properly on my first thoughts of it. Don't know, I've not had anyone else offer up any thoughts or suggestions yet either. You are right about worry of holding up though, it takes a thicker foam for some sizes/shapes, which also means extra material, and it drives the prices up to much. I already use one of the highest priced foam brands for some safety measures and length of use. 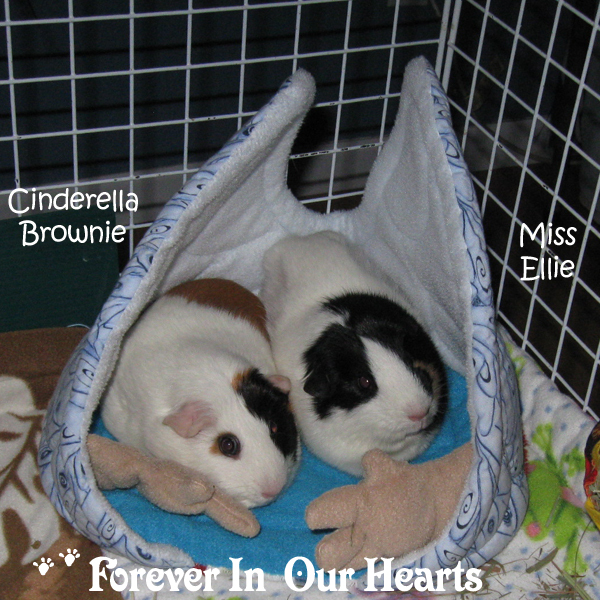 WindeSpirit, I'm so sorry for the loss of Ellie. You have my deepest sympathy. Rest in peace, little Ellie. You are loved and missed. Thank you Bookfan and GrannyJu1. Unfortunately I've got more bad news, in the wee hours last night/this morning, my grandmother passed away. I'll be going up to Indiana and Michigan for this one. All orders will be delayed 1&1/2 weeks. Oh, I am so sorry, WindeSpirit. You have my sympathy. Oh no! WindeSpirit, I am so very, very sorry! I'm sorry to hear about your grandmother and Miss Ellie. I hope you have safe travels. Thank you for the condolences. The trip up this time was, ah, rather interesting. Let me just tell you all this, never, ever, trust your GPS, specially at night. I was forced to finally buy a new pair of shoes, so I guess something good did come from that. The trip back home was much better and little bit noisey at times, in a good sort of way. Stopped off in Sellersburg at Rescued Guinea Pigs Inc., visited for a short time, pignapped a couple girls, one of them just for a quick transport to meet another, and we've been getting caught up and settling back in since. I think I'm caught back up anyhow.